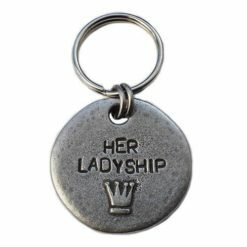 Give your dog something as special as they deserve with our beautiful, hand made dog tags. 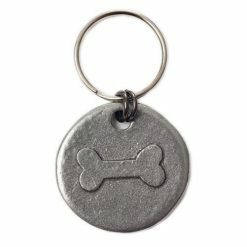 Our precious metal id tags have a beautiful antiqued appearance with a slightly hammered finish. Made from 100% solid Pewter, our chunky dog tags won’t bend, distort or discolour. 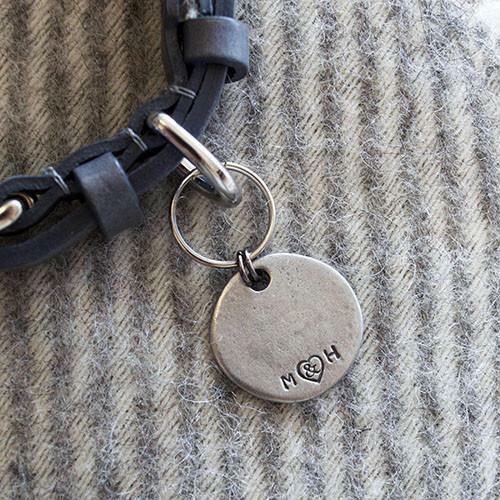 As is the nature of hand made items, each tag is slightly unique and irregular which adds to their charm. Choose from 3 simple and elegant motif designs, and 3 hand stamped designs with fun slogans devised by M&H and inspired by our own dogs. On the reverse you’ll find lots of free space for a local engraver to add your own personalisation. Each dog tag is supplied with a strong split ring to attach the tag to your dog’s collar, and not one but two thick jump rings securing your dogs tag to the split ring and holding the tag in the correct position. Supplied in a gift box. 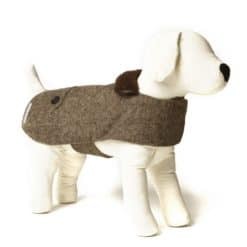 Made by Mutts and Hounds.